University of Oregon students have been caught Harlem Shakin' with Puddles at the EMU, in front of minivans on Ferry Street, and amongst architecture majors. University of Oregon students have been caught Harlem Shakin’ with Puddles at the EMU, in front of minivans on Ferry Street, and amongst architecture majors. While it originated more than three decades ago, it has only recently captivated the attention of the Internet. On May 17 of last year, an artist named Baauer released a track entitled “Harlem Shake.” And while Baauer’s track lasts for over three minutes, it’s the first thirty seconds or so that have gone viral — right up until you hear some large animal (I’m guessing a lion?) growl. The song features the phrase, “Do the Harlem Shake,” the repeated growling, and a mixture of house jam beats, bass drops, and funky synthetic laser sounds — kind of like if Alvin and the Chipmunks did the light saber sound effects in Star Wars. As a side note, Baauer describes himself as “the love child of Brooklyn and the Internet” who was “born out of noise” and now creates music that is “the delectable fusion of future-crunk and leather shaken aggressively in a bottle for years.” True story. The virality of Baauer’s track began about two weeks ago when four costumed figures made a video of themselves dancing to the first thirty seconds. That original video now has over four million views. Since then, a plethora of other people have made their own videos, including the Norwegian military, firemen inside a fire truck, My Little Pony, and the “Today” show. I would say everyone but your grandma is doing the Harlem Shake these days. But that would be a lie. Because grandmas are doing the Harlem Shake, too. Love it or hate it, I am glad for one thing: now that everyone is in love with the Harlem Shake, that means people will start forgetting about Psy’s “Gangnam Style.” At some point soon, I will be over this Harlem Shake craze, too. But I can sleep at night knowing that, even if I have to encounter new version after new version for the next month, each version is only 30 seconds long. 30 second long viral videos are always superior to 4 minute long viral videos (aka Gangnam Style remakes). 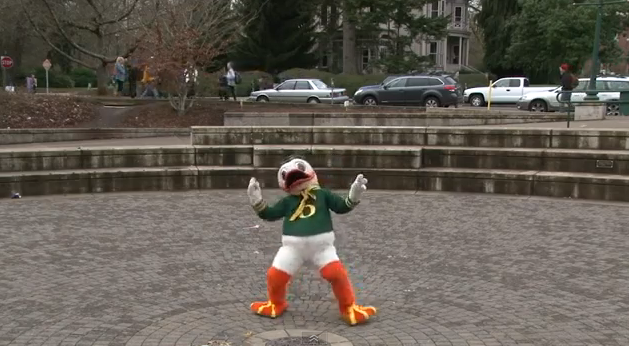 University of Oregon students doing the Harlem Shake down Ferry St.